Tumour necrosis factor (TNF)-α inhibitors, despite being an effective treatment for granulomatous diseases such as sarcoidosis and Crohn's, are recognised to trigger a paradoxical granulomatous response.1 ,2 Reported cases have predominantly described lymph node, pulmonary and skin manifestations. We present a case of a granulomatous thoracic spine lesion, leading to atraumatic fracture, arising as a consequence of etanarcept treatment of connective tissue disease with associated interstitial lung disease (ILD). A 50-year-old woman, a retired hairdresser, with rheumatoid arthritis/Jo-1 overlap syndrome, diagnosed 14 years earlier, and with associated but hitherto stable ILD, was referred to the ILD service with progressive dyspnoea and deteriorating lung function. Other relevant medical history included febrile neutrophilic dermatosis. The patient reported smoking 10–20 cigarettes per day, but had had no occupational or animal exposures and no past exposure to tuberculosis. At presentation, there was marked joint destruction though no active synovitis, and systemic symptoms were well controlled with the anti-TNFα monoclonal antibody etanercept which had been commenced in 2006. Prior to commencement of the etanercept, a Heaf test had been negative. There was no history of significant corticosteroid usage. Respiratory examination was remarkable only for fine bi-basal inspiratory crackles. Pulmonary function tests in January 2006 demonstrated a forced expiratory volume in 1 s (FEV1) of 2.62 L (95% predicted), forced vital capacity (FVC) 3.27 L (105% predicted), with diffusion coefficient for carbon monoxide (DLCO) 5.08 mL CO/Min/mm Hg (60% predicted). At presentation to the ILD service in May 2010, the values had fallen to FEV1 2.02 L (78%), FVC 2.53 L (86%) and DLco 3.73 (44%). Autoimmune profile demonstrated a positive rheumatoid factor (99 IU/mL), a positive antinuclear antibody and the presence of anti-Ro, anti-La and anti-Jo-1 antibodies. A high-resolution (HR) CT scan of the thorax and an echocardiogram were arranged. HRCT of the thorax demonstrates subpleural reticulation and honeycomb change in a predominantly basal distribution. The appearances are consistent with the radiological pattern associated with the histological lesion of usual interstitial pneumonitis (UIP). Echocardiogram demonstrated no evidence of pulmonary hypertension. This lady's presentation raises concern over progressive parenchymal lung disease on a background of complex connective tissue disease. While the HRCT would be consistent with UIP in the context of rheumatoid arthritis, her immunological profile and underlying diagnosis is of an overlap syndrome with antisynthetase syndrome. This would more characteristically give rise to ILD with a better prognosis and which may be reversible with immune suppression. As such, knowledge of the histolopathological characteristics of the lung would help determine optimal management. A video-assisted thoracoscopic surgical (VATS) lung biopsy of the left upper and lower lobes is indicated. 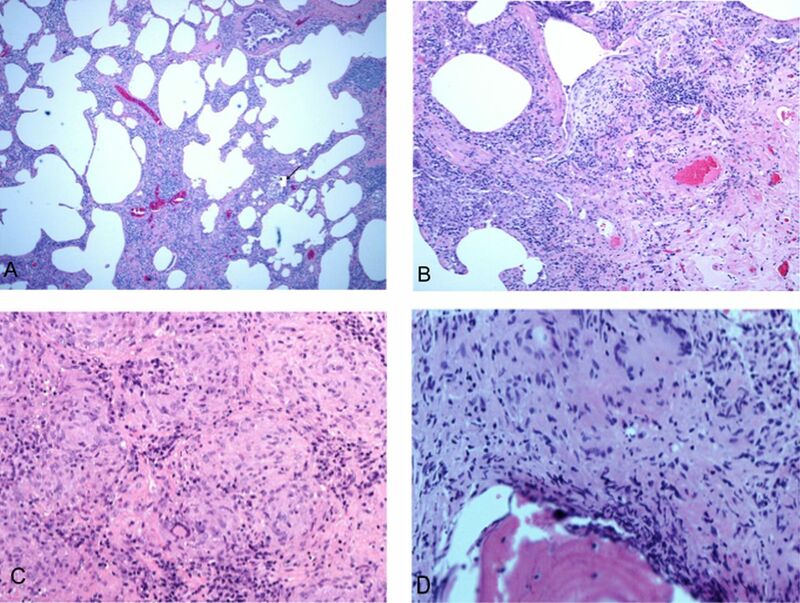 Histopathological assessment of the VATS lung biopsy (see figure 1) demonstrated a UIP pattern in the lower lobe (B) and a pattern in the upper lobe consistent with non-specific interstitial pneumonitis with features of organising pneumonia (A). This combination of histological features is consistent with her overlap connective tissue disease (CTD). (A) Upper lobe video-assisted thoracoscopic surgical (VATS) biopsy showing diffuse chronic interstitial inflammation with a small poorly formed granuloma. (B) Lower lobe VATS biopsy showing interstitial inflammation with fibroblastic focus. (C) Lymph node replaced by epithelioid cell granulomata. (D) Granulomatous inflammation involving vertebral body. This lady's case was discussed at our joint specialist respiratory-rheumatology ILD-multidisciplinary team (MDT). Following discussion it was decided to commence mycophenolate mofetil (MMF) (in addition to etanercept) as combined therapy to control both the ILD and joint disease. It was felt that the etanercept could be continued, since the ILD predated its introduction and had been stable up to that point. Review at 12 months demonstrated stability of the FVC at 2.58 (87%) and an improvement in DLCO to 4.38 (55%). There was an associated improvement in dyspnoea and a reduction in cough. The joint disease remained well controlled. Nine months later, symptoms of general malaise and night sweats developed and, from pain in her left hallux, an infection was diagnosed in some longstanding surgical metalwork. This was treated with intravenous antibiotics and by removal of the metalwork. Etanercept was discontinued, and in the course of investigating her constitutional symptoms, a CT thorax was performed. This CT demonstrates new, large-volume, mediastinal adenopathy. This has been further characterised by PET-CT, which demonstrates marked avidity of the hilar and mediastinal lymph nodes (standardised uptake value max 14.2). The new finding of significant adenopathy raises the suspicion of malignancy or granulomatous disease and requires mediastinoscopy. Histology of the excised lymph node (see figure 1) discloses effacement by non-necrotising granulomatous inflammation (C). The appearances are consistent with granulomatous disease, but clearly infection must be excluded. A Quantiferon test was negative and Ziehl–Neelsen staining did not identify any acid-fast bacilli. Subsequent culture of lymph node samples, obtained by endobronchial ultrasound-guided fine needle aspiration (EBUS-FNA), were negative on smear testing; additionally, PCR tests (at the regional reference laboratory) for mycobacteria were negative, and prolonged liquid culture of the specimens for mycobacteria were also negative. The Quantiferon test has been shown to have occasional false negatives when used in immunocompromised patients. The alternative interferon gamma release assay, T-Spot.TB, may have better sensitivity in this population,3 however, unfortunately it was not available for use at the time. The patient's constitutional symptoms settled with treatment of her infected metalwork and, therefore, antituberculous chemotherapy was not commenced. One month later, the patient was admitted due to severe back pain. An MRI of her spine was performed, demonstrating an atraumatic fracture at T7 and vertebral body changes at multiple levels (T10, L3, L5). Although rare, the appearances are consistent with granulomatous disease; vertebral involvement with Sarcoid is rare but well described. This can present as lytic lesions with or without sclerotic margins or vertebral collapse associated with osteonecrosis. The imaging appearances are not specific and a differential diagnosis of infection (typical or atypical), metastases or lymphoma should be considered. A dual-emission X-ray absorptiometry (DEXA) scan was performed which demonstrated spinal osteoporosis with an age-matched T score of −1.7, but no evidence of femoral osteoporosis. The patient underwent a vertebroplasty to stabilise the fracture, and at the same time a biopsy was performed of the L3 vertebral body. This showed partial replacement of the marrow space with fibrotic tissue and non-caseating granulomata (D). Again, prolonged liquid culture of the sample gave no growth of mycobacteria following a negative smear, and PCR testing for mycobacteria was negative. MMF was stopped and prednisolone 20 mg was commenced and tapered over the subsequent 3 weeks to a maintenance dose of 10 mg. This cautious dose was chosen due to the lack of clarity in her diagnosis, along with concerns over her bone health. The decisions regarding dose and duration of therapy were made by the multidisciplinary team. The patient's respiratory symptoms remained unchanged, as did her chest X-ray. Lung function testing was unfortunately unreliable due to the severe back pain related to her vertebral fractures. A diagnosis of anti-TNFα-induced granulomatosis was made, with consequent atraumatic vertebral body fracture. Due to patient choice and the technical difficulty of surgery, there has been no further intervention following the initial vertebroplasty. She has been weaned from analgesia and has no ongoing back pain. She remains under orthospinal team review. She has had no further constitutional or infective symptoms. We have had success in treating CT-ILD with rituximab,4 this would be an excellent drug to use at this stage to provide effective treatment of her pulmonary and systemic disease. The patient has subsequently been commenced on rituximab (at a dose of 1 g repeated after 2 weeks) and her corticosteroids discontinued. At 6 months, she received a further set of rituximab infusions. There is no evidence of mycobacterial infection. We are not aware of any previous reports of such a consequence of anti-TNFα therapy. There has been a recent increase in reported cases of biopsy-proven granulomatous disease resulting from etanercept, infliximab and adalimumab given as treatment for immune-mediated diseases.1 There has been a single report of such disease affecting bone.2 Although characteristically thought of as a proinflammatory cytokine, TNF-α also exerts anti-inflammatory effects through its action on regulatory T-cells (Tregs).5 This suppression of Tregs is blocked by TNF-α inhibition. Anti-TNF-α therapy also results in an enhanced proliferative response of circulating CD4 cells to T cell receptor (TCR) stimulation, and increased interleukin-17 and interferon-γ expression. This unbalances CD4 cell activity, especially T-helper 17 cells (which are found in increased numbers in rheumatoid disease6). These same pathomechanisms have been identified in systemic granulomatous diseases, such as sarcoidosis,7 and may well be the reason for the paradoxical development of multisystem granulomatous inflammation in a subset of patients treated with anti-TNF- α therapies. Bony lesions are a rare but documented complication of sarcoid and, therefore, by extension, can be expected in the context of anti-TNF-α induced disease. As in this case, the development of atraumatic fractures in an individual with significant coexistent systemic disease presents a significant diagnostic and therapeutic challenge. This case highlights an important potential side effect of anti-TNF-α agents, and illustrates the need to carefully balance potential risks against anticipated benefits before commencement of therapy in individuals with CTD-ILD. Combined specialist ILD-rheumatology MDTs provide an invaluable forum for such decision making.
. Sarcoidosis: an underestimated and potentially severe side effect of anti-TNF therapy. Joint Bone Spine 2013;80:104–7.
. Adalimumab-induced noncaseating granuloma in the bone marrow of a patient being treated for rheumatoid arthritis. Rheumatol Int 2009;29:437–9.
. IFN-γ release assays in the diagnosis of latent tuberculosis infection among immunocompromised adults. Am J Respir Crit Care Med 2013;188:422–31.
. Severe interstitial lung disease in connective tissue disease: rituximab as rescue therapy. Eur Respir J 2012;40:641–8.
. TNFα: activator or inhibitor of regulatory T cells? Joint Bone Spine 2012;79:119–23. .—The role of T cells in Rheumatoid Arthritis: new subsets and new targets. Curr Opin Rheumatol 2007;19:284–8.
. Sarcoidosis is a Th1/Th17 multisystem disorder. Thorax 2011;66:144–50. Contributors The article was conceived by MAG and CS and written by MAG, CS and TMM. All authors contributed to the care of the patient and approved the final text.